Zach Lutz is happy to be back in the United States. But the Las Vegas 51s infielder wouldn‘t trade the experience of his whirlwind last 14 months for anything. Zach Lutz is happy to be back in the United States. But the Las Vegas 51s infielder wouldn‘t trade the experience of his whirlwind last 14 months for anything. Lutz, a corner infielder, is back with the 51s after playing in Japan during the second half of last season and in Korea early this season. 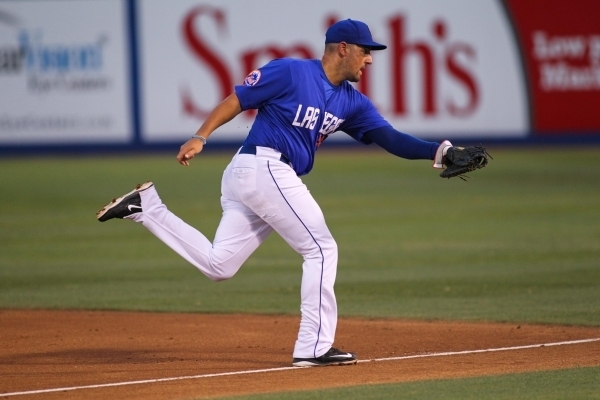 "It‘s a relief to be back here," said Lutz, who on Monday played in just his fourth game since returning to the 51s. He went 0-for-2 with two walks and a run in a 9-2 loss to Fresno in the opener of a four-game series at Cashman Field. Lutz was the New York Mets‘ fifth-round pick in the 2007 draft and spent his entire professional career in the Mets‘ organization before he left in June 2014 to join the Tohoku Rakuten Golden Eagles of Japan‘s Pacific League. 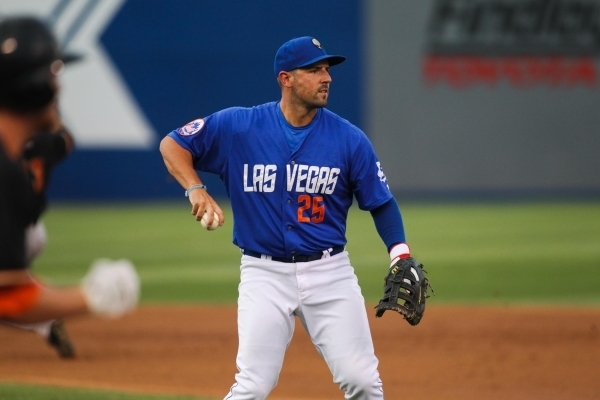 Lutz hit .291 with seven home runs and 37 RBIs in 59 games with the 51s before heading overseas. "I was doing pretty well here last year, and the opportunity came up to play in Japan and make some good money," Lutz said. "It helped make me a better baseball player, too." On a team that also included 10-time Gold Glove winning outfielder Andruw Jones, Lutz played in 15 games, hitting .314 with five home runs and 18 RBIs. "There are some really good players over there," Lutz said. "The game is the same as it is here. The way they prepare is a little different. You get to the field a lot earlier, a lot more reps, and the whole batting practice routine is different, so you have to get used to it." Life away from the game was different for Lutz, whose wife, Lindsay, went with him. It was Lutz‘ first trip to Japan. "It was tough, but it helped to have my wife with me," Lutz said. "I was lucky to have a translator that spoke really good English, which helped me out a lot. You have to make adjustments, but when it came to baseball, everything just came together." Lutz returned home after the season to have thumb surgery and was set to start the 2015 season in Japan but ended up signing a one-year, $550,000 deal with the Doosan Bears of the Korea Baseball Organization League. "Things didn‘t work out, so I ended up going to Korea to play," Lutz said. "Playing there was different than anywhere I had ever played before. The competition was different." Hindered by a back injury, Lutz went just 3-for-27 with one homer and three RBIs before the club placed him on waivers in early May. Lutz returned to his home in Mohnton, Pa., and began working out with his father. Ironically, a spot opened on the 51s roster when hot-hitting Alex Castellanos left the organization last week to play in Japan. Castellanos hit .314 with 32 doubles, 16 homers and 56 RBIs in 79 games this season. "The Mets called, and they‘re like a second family to me," Lutz said. "It‘s very comfortable being back. I‘m just here to help any way that I can." Lutz went 4-for-5 with a double and three RBIs on Thursday in his first game back with the 51s. He has played 22 games with the Mets, most recently in 2013 with he hit .300 coming off the bench. "He looks like the same hitter," said 51s manager Wally Backman. "He‘s 100 percent now, and Lutz can hit. He has proven that. He just have to keep doing the same things he has been doing, and maybe work on his defense. The organization knows him, and that‘s big plus. He‘s got power, and he‘s a run producer." And after 14 months of criss-crossing the globe, he‘s hoping the experience helps him in his quest to return to the big leagues. "It was an opportunity to make myself a better player," Lutz said. "To go over and play every day and learn a whole new culture, I‘m happy I did it. It made life a lot easier for me. I‘m more relaxed playing. I used to go out and put a lot of pressure on myself to perform, but now I just go out and work hard every day. I want to get better every day. "I just want to continue working hard, and keep swinging the bat like I know I can and the organization knows I can."